Why is it necessary to Chew so well? We have been given the most sophisticated and perfect tools for chewing our food correctly. These include specially designed teeth, a tongue that controls and performs so many functions, cheeks that also assist us to chew, the production of saliva which in turn provides enzymes – all to assist us in chewing correctly so as to change the food to a nutritious bolus for the next stage of digestion. Why? It must surely be because we need to chew our food well, being a critical and important part of the Digestive System Process – and the ONLY part of the Digestive Process that WE have been given the responsibility of doing correctly and efficiently. In which way have we been given this responsibility? Chewing and masticating our food in the best way possible is obviously our duty. Why would we need so many different types and designs of teeth, each type strategically positioned, if the rest of the digestive system could do the same job? In addition, this is the first part of the process which communicates with the brain, which in turn passes messages to the next digestive organs in line. How can I prove this to myself and become convinced of its correctness? First and foremost, try to understand the logic. Don’t fight it, give it a chance to make sense. Once this is agreed, let’s look at an obvious fact. Have you noticed or realized that most overweight people EAT TOO FAST and fail to chew their food correctly? What is the main consequence of NOT chewing correctly? We do not give the rest of our digestive system the chance to do their numerous and specific tasks as efficiently as they were designed to do. The result is an accumulation of undigested food that cannot be passed through as essential nutrients, but rather as an accumulation of excess “food” that remains behind as excess fat. We then become infected with such ills as obesity, heart disease, diabetes, poor digestive systems, anorexia and loss of energy – leading to fatigue, poor breathing habits, poor posture and inactivity. It is actually quite simple with delicious results! It may take a few days to get in to the swing and habits, but the results will be most rewarding - especially because you would have accomplished the improvements using natural means and you will have taken control of this most vital function. - First and foremost – too large a quantity per mouthful cannot and will not be chewed as required. - Discipline yourself to feed in smaller manageable quantities. - At the outset, try to appreciate all that your tongue is doing from the time you put some food into your mouth until the tongue is ready to guide the food to the next stage of the digestive process. The Human Tongue. - The cheeks, lips, tongue and teeth will – or should - be heavily involved. - The food needs to be changed from solids to digestible nutrients with the help of the tools - teeth, lips, cheeks, tongue, saliva and enzymes. This cannot be achieved with big mouthfuls. - Physical digestion breaks the food down into smaller pieces. To do this, the surface area of the food is increased and spread out so as to allow the saliva and enzymes to work more efficiently and speed up digestion. - Soon you will be chewing and masticating correctly and you will not have to think about the process once the habit kicks in. - So remember the initial requirement – small quantities of food with every mouthful. Again, it is a physical impossibility to chew a large mouthful of food correctly. Some of it will slip away and be swallowed without being chewed, with serious negative results. - In addition, enjoy your meals in a relaxed atmosphere without being tense or rushed. - The tongue can only recognize the various flavors if the food is chewed well and if it has enough time to register these various elements. It will then send messages to the brain, which in turn will send messages to the digestive system, which will result in the release of the required digestive juices needed for the efficient and healthy digestion to take place. - Chewing well also allows the nutrients from the masticated food to be more quickly released more quickly and assimilated by the digestive system. - Once the well chewed food (now called bolus) arrives in the stomach, its digestive juices will be more effective in fulfilling their job. - It is logical therefore that less energy will be required by the body in absorbing the nutrients at every stage of the digestive process. - The well masticated bolus travels much more smoothly through the various digestive organs, starting with it passing through the esophagus. - Sufferers from reflux could find almost total relief. - It is not a coincidence that most people who eat quickly and fail to chew correctly and efficiently, are overweight. - The synergy of you Chewing well and the properties of Saliva results in an efficient digestive system. - And we should all be aware of how a poor digestive system can play havoc with our health and can only promote sickness and disease. - The famous old saying – “Slowly but Surely” – applies so appropriately to the chewing process. - Don’t look to make big dramatic changes in your lifestyle all at once. Small steps will add up and last longer than making drastic changes. A little change in your eating habits will have a more positive impact on health because you are more likely to stick with it over time. - By taking smaller mouthfuls, you will allow the taste buds to function efficiently, the brain will receive the right messages, and the whole digestive system will work more efficiently AND guess what? You will automatically enjoy your food better AND cut down on your calorie intake without feeling deprived or hungry. - Imagine reducing your calorie intake WITHOUT dieting! AND an extra bonus is that you will feel more satisfied. That may sound impossible, but in reality it is not that difficult and is a fact. The old saying – “You are what your Eat” should have a rider to it – “… and How you eat it”. How and where is the all-important Saliva produced? - the Submaxillary glands, also known as the Submandibular glands, are located near the jawbone. Saliva helps us fight off bacterial infection. But this defense is only really efficient if you chew your food well so as to create a larger surface area of food on which the saliva and enzymes can act against food-borne bacteria. Many obese people have noted and persevered with our non-invasive and natural chewing disciplines. Their positive results are proving beyond any doubt that they could improve their general health and lose excess fat without dieting! Why do we have four different types of teeth, all specifically placed for the maximum efficiency of – Chewing? They help you to tear, cut and break up different foods in to very small pieces. 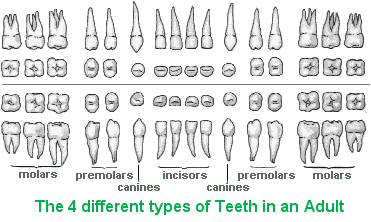 There are four different types totaling 32 teeth in the mouth of an adult. An adult person has 32 teeth. - The hard material of the tooth is composed of calcium, phosphorus, and other mineral salts. - The material in the majority of the tooth is called dentine. - The hard, shiny layer that you brush is called the enamel. Please use the very specific tools given to you – to be used in the part you have to play in the critical chewing process - to chew smaller mouthfuls of food well, in a relaxed atmosphere, whilst savoring and enjoying every mouthful - as required by your body for better health all-round. We cannot emphasize enough the importance of the chewing process. What about surgical procedures or jaw-limiting devises? The underlying principal behind surgical procedures and other jaw-limiting devices, is to limit the intake of food, particularly the per mouthful quantity. This seems to confirm the logic of the natural methods as presented and explained throughout all our articles, which are much less invasive and will be of a life-time benefit. - The result? A fulfilling experience which will have been performed according to the body’s needs for better health all-round.